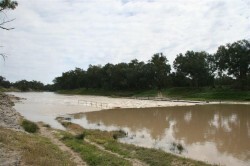 We have finally crossed the swollen Darling River on arrival at Bourke. We are staying at Kidman’s Camp Caravan Park in North Bourke, a lovely park that completely fills up at night with tourists and empties out in the morning! 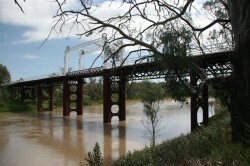 It is right on the Darling near the old bridge, built in 1883. We did some sightseeing around Bourke and visited the old weir built in 1897, the only one of its kind built on the Darling. We used a “Mud Map”to find the weir and spent a lot of time back-tracking and getting off private property before we found the right spot. You can see vehicle tracks on both sides of the river that are now cut off by the high water. 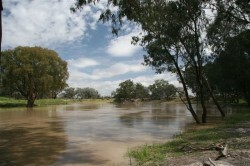 We picnicked at the old wharf on the Darling in Bourke to the “tuneful” sounds of an old steam engine. Yesterday we drove to May’s Bend, where there is a great camping spot, although you’d be looking for high ground at the moment. On Sunday we planned to have lunch at Mt Oxley or Gundabooka National Park, but after an inch of rain overnight all dirt roads are closed, bugger! What is worse, the roads on the east and west sides of the Darling are also closed so our planned station stays are off, because they expect the roads to be closed for a few days. Hopefully the road to Gundabooka may be open tomorrow so we can camp there, if not, it is off to Cobar and Lake Cargelligo to see this lake that was dry on our last visit a couple of years ago. We have enjoyed our stay in Bourke and will be back again, fancy the rain changing our plans in what is usually a dry part of Australia!